A songwriter has said she is "so happy" and "proud" after winning a Grammy for co-writing Ed Sheeran's Thinking Out Loud. Amy Wadge, from Church Village, Rhondda Cynon Taff, collected the award with Sheeran for song of the year for their number one hit. The pair attended the ceremony in Los Angeles together, receiving their award from Stevie Wonder. Afterwards, Wadge tweeted: "Oh my god I am so so happy right now." She added she was "damn proud of @edsheeran we won song of the year woo !!!" 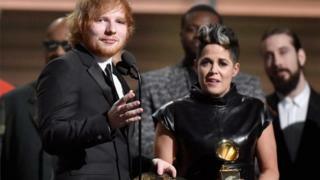 Sheeran, who also won a Grammy for best pop solo performance, thanked Wadge on stage "for writing the song with me". "We wrote it on a couch in my house after having dinner - quite odd," he added.